I’ve changed the header image of this blog as a way to reference — and to remember — the Gulf oil spill. It’s a another postcard “slice” from my grandfather’s album, this time of Baku, currently capital and largest city of Azerbaijan, indeed of all the Caucasus, a port city on the Caspian Sea, which he travelled in and out of while serving as medic on the Russian troops trains during World War I. There are 11 scenes of Baku in the more than 80 postcards in his collection. 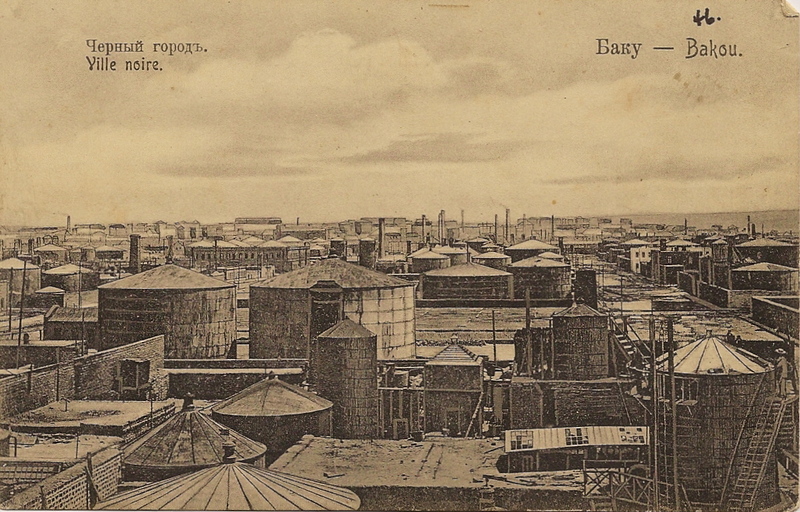 This one is of “Black City,” the industrial oil belt established in Baku. “The Black City was a cluttered landscape of oil rigs, metal storage tanks, refineries, heavy industrial manufacturing buildings and housing for workers,” says one source. The name came from “the heavy, black pall that hung above it and the smell of oil so thick that its taste lingered in your mouth.” Incidentally, the oil company that first came to prominence in Baku was founded by the Nobel brothers (one of them being Alfred, of Peace Prize fame). The Nobel Brothers Petroleum Company started extracting oil there in 1874 and dominated the European market until the Russian Revolution. Worldwide it was second largest after Rockefeller’s Standard Oil. Black City, near Baku. Postcard about 1914. Today I watched three maneuvering birds, soon up in the air, then swimming on the sea — a beautiful picture! Too bad that inventions like that are used to destroy life and culture. It was a coded message, it seems, about war planes. At that time, the view of chimneys and pipes was a symbol of progress and mankind’s achievements. No one was concerned about environment and ecology. It’s sometimes said we have a love affair with oil. Yes, and it’s a sordid one. And now, again, though hardly able to shake our oil dependency (I speak for myself), we mourn the failure, the terrible damage. I go about my daily tasks, and then I’ll remember the gallons of oil shooting from the ocean floor, and the suffering of humans and creatures in the Gulf states. Will today’s attempt, apparently risky, finally plug the spill? It finally occurred to me that I might keep this more deliberately in my prayers. Oh God, may it work! This entry was posted in Current events, History, Personal and tagged Baku, Gulf oil spill, Heinrich Harder, love affair with oil, Nobel brothers, postcards by doradueck. Bookmark the permalink. Dora, Wouldn’t it be wonderful to publish a book of your grandfather’s postcards and letters, together with your reflections? These postcards: what a treasure trove of history! (And they are so beautiful.) I feel it as I edit MB obituaries: we’re losing storytellers. How long before obits no longer say, “She was born on the train westward after her parents landed in Canada?” or “They met on the great trek out of Russia, married, and cleared jungle in Paraguay to start their farm?”) We need to capture and pass on as many of their stories and pictures (mental and photographic) of our past as we can. I have trouble believing that my generation will have a “Canadian Mennonite history” to tell our grandchild that comes anywhere close the “adventurous overcoming” of my grandparents’ and great-grandparents’ experience. I never thought of a book of reflections, Angeline, but I certainly am fascinated by the postcards and letters. Will have to keep it in mind. 🙂 Add it to the list of things I’d still like to do! One of my aunts translated the love letters and another did a kind of narrative of them, so maybe I feel they’ve been “done” enough! — Re. your comments about storytelling; interesting — true, our Canadian Menno stories may be quite different, and lack the adventure of geography, but maybe there are other kinds of “adventurous overcoming” — even such as you (or I) experience? I see you living such a life. — I’m not sure how it all fits with the fact that there seems a great hunger for memoir. — BTW, I enjoyed reading your blog response to my book. Thanks for taking the time to set it down.